49 high-intensity colors, including Iridescent and Fluorescent colors. Full intensity and transparent. Add to refillable markers, ruling pens or technical pens. Great for illustration and fine detail. Flows effortlessly from a brush. Great for staining and color washing. Pour right from the bottle! Introducing GOLDEN High Flow Acrylics, a new acrylic paint line that can go from brush to marker or from dip pen to airbrush and more! From fine lines to broad strokes, High Flow Acrylic has an ink-like consistency that lends itself to a wide range of techniques, including staining effects, leveling colors, calligraphy, and mixed media. 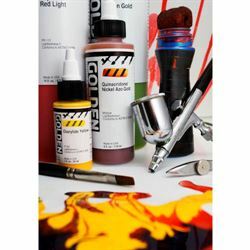 Replacing GOLDEN Airbrush Colors, beginning July 2013, the NEW HIGH FLOW FORMULA offers several improvements over Airbrush Colors, most notably an increase in durability of dry paint and more colors.